If you are reading this then you are interested in swapping buttons with me. As of March 2012 I am looking for blogs to button swap with. with a link to your blog. All button swaps will start on the 1st of each month and run until the last day of that month. Those who I do swap with are asked to be followers of my blog and are required to post one of my buttons on their blog for the same month period. Guest post swaps are also available upon request and are limited to button swappers for that respective month. 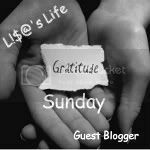 This does not affect participation as a guest blogger for the series Gratitude Sunday. All bloggers have the opportunity to swap, however I hold the right to refuse to swap if your blog does not comply with the integrity of my blog.